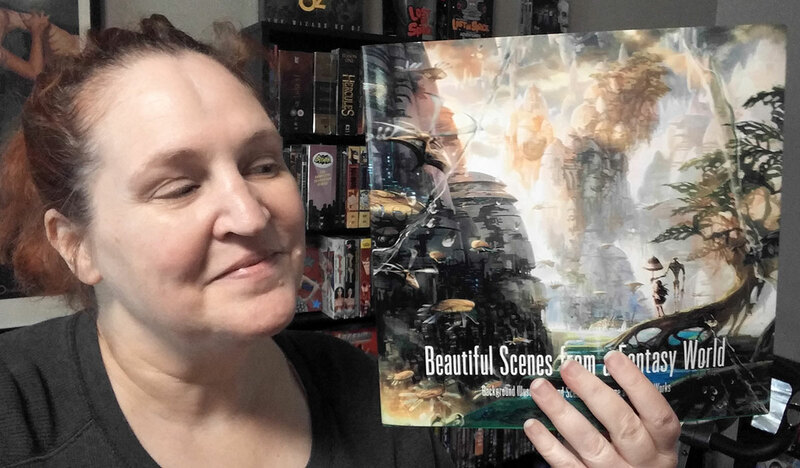 Like its companion, Everyday Scenes from Parallel Worlds, Beautiful Scenes from a Fantasy World is a heavily illustrated book that is light on text because it is centered on the mise en scène. Available on Amazon in paperback. You can find it at other online and offline booksellers, as well. This is the second title in the Everyday Scenes from Parallel Worlds series. It showcases background artworks featuring fantasy worlds, including celestial castles, pirate ships sailing through the clouds, retro-futuristic inventions, deserted architectural spaces, towns that have sunk under the ocean, an enchanted forest and a space locomotive that runs in neo-futuristic world. Attention is focused primarily on the beauty of the illustrated backgrounds, rather than characters in the foreground. I won’t repeat what I said in my review of Everyday Scenes from Parallel Worlds, although those comments are just as applicable to this next book in the series. This volume focuses more on fantastical worlds, so it includes a lot of lush scenery and whimsical lands. The illustrations tend to be very colorful, as well. Many of the illustrations are very detailed, it would have been nice to see them a bit larger so that I could examine those details more closely. That said, making the book any larger would have made it unwieldy, so I guess that isn’t something the publisher could fix. Like its companion, I think this book would be well served by a hardcover edition. And, again, I would appreciate larger text. If any of these pieces of art are available for sales as prints, I would love to know where to find them! I would love to hang Journey 2 on page 21 on my wall. I think this volume has a bit wider audience appeal than the first. The fantasy art is bright, lush, emotive and beautiful.